I’ve never really been into mascot platformers, especially 3D platformers. I could never get into Crash Bandicoot, MediEvil, Banjo Kazooie, or Spyro. Hell, the only 3D Mario games I’ve actually played from start to finish are Sunshine and Odyssey. I find this important to specify at the beginning of this review, because you need to understand that I’m coming into Spyro Reignited Trilogy as someone who doesn’t have much history with or love for the character, or even the genre. So when I fired up Spyro Reignited Trilogy earlier this week, I was more wary than excited. My trepidation, however, subsided very quickly as I was met with a gorgeous and charming platformer with some of the best controls outside of the Mario games. Reignited, unlike last year’s Crash Bandicoot: N. Sane Trilogy, is not a remaster but a full ground-up remake (though honestly, I wouldn’t be able to tell). The remaster job was done by Toy for Bob, the same team behind the Skylanders franchise, and they’ve done a stellar job of elevating Insomniac Games’ original art direction and bringing it into the current generation. Spyro Reignited Trilogy borrows judiciously from the high fantasy aesthetic of films like Shrek and Tangled, delivering a look that often looks closer to a pre-rendered PIXAR film than it does to a videogame. While all of the levels and environments look phenomenal, the real appeal of the remaster shines through in the character designs more than anything else. All of the characters you meet, especially the dragons you rescue over the course of the game, look unique and are bursting at the seams with personality and charm. Spyro himself is an adorable little critter but with a slight edge and a constant, boyish smirk. The other thing that’s really great about the remaster is the controls. Since I never played the original games, I can’t really compare them here, but the controls in Spyro: Reignited are smooth as butter, and every bit as responsive as you can expect from a 3D platformer. This is further helped by the fact that Spyro, as a character, is less about pixel-perfect acrobatics and more about gracefully moving through levels on wings and all fours. Something about the main character being a quadruped just makes this feel really smooth and intuitive and takes me back to my memories of playing Okami for the first time (which was this year, on Switch, because apparently, I missed all of the classics back in the day). You run around the levels with ease, jumping and gliding from platform to platform, and you can hold a button to sprint which just feels amazing. The animations and visual effects going in convey a delightful sense of speed when you sprint, and headbutting enemies at the end of a full run just never stops feeling amazing. You can also breathe fire, and the two shoulder bumpers are dedicated to rolling left and right, if you want to channel your inner Dark Souls fan while fighting some of the peskier armoured baddies. 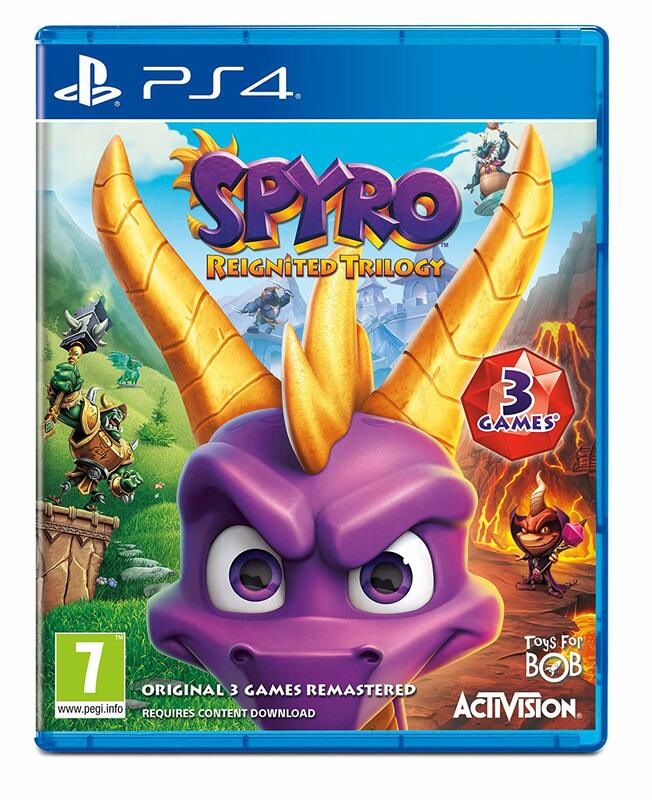 Spyro Reignited Trilogy packs in the first three games in the series, which would be Spyro the Dragon, Spyro 2: Ripto’s Rage!, and Spyro: Year of the Dragon. The controls and visual fidelity is consistent throughout the package, and all three games have great music. And given the collect-a-thon nature of classic platformers, all three games put together have enough content to last you the rest of the winter. Spyro Reignited Trilogy was reviewed using an Xbox One downloadable code of the game provided by Activision. The game is also available on PlayStation 4 via digital and retail store releases. We don’t discuss review scores with publishers or developers prior to the review being published (click here for more information about our review policy). Spyro Reignited Trilogy is the best kind of remaster, striking a healthy balance between nostalgia and innovation, aiming to make the game look and play as good as your memories of it, rather than how it actually was. It’s a great time for everyone regardless of the more nostalgic among us, or people like me who never played the originals. James Gournalist was born of a freak accident when he fell into a lethal vat of radioactive videogames. His superpowers include a borderline academic obsession with videogames and the inability to shut up about how great The Witcher 3 was.